A former Air Force translator, Peter A. Prahar, is the latest ambassador to the Federated States of Micronesia (FSM), a country of tiny, scattered islands in the Western Pacific. In 1983, the US and FSM governments entered into a status of Free Association, which provides Micronesia with significant financial assistance in exchange for U.S. defense rights in the region. The FSM islands were part of the Trust Territory of the Pacific Islands, established after World War II by the United Nations but administered by the United States beginning in 1947. The FSM consists of four states: Yap, Chuuk, Pohnpei, and Kosrae. These four out of the original seven Trust Territory districts are together for one reason—the U.S. had no plans for military bases in any of them. President Barack Obama nominated Prahar for the post October 9, 2009, and he was confirmed by the Senate November 20. Prahar’s father, Louis, was a land surveyor and his mother, Ruth, was an attorney and a high school math teacher. Born circa 1951, Prahar grew up in the small Oregon coast town of Bandon and graduated from Bandon High School in 1969. As of 2009, he had not visited his hometown since 1972. After graduation, Prahar joined the Air Force, which sent him to the Defense Language Institute in Monterey, California, to study Mandarin Chinese, and then to Air Force Intelligence School. Prahar served as an Air Force linguist from 1971 to 1975, with assignments in South Korea, Taiwan and Japan. Prahar also took classes at the International Christian University in Tokyo, transferring his credits back to the University of Michigan, from which graduated with a B.A. in Political Science. Prahar ran a Radio Shack store for about 10 years in San Francisco before joining the Foreign Service. 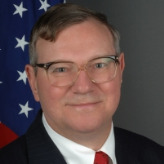 A career member of the Senior Foreign Service, Prahar’s early postings included tours in the China, Japan, Albania, Ireland, the Democratic Republic of the Congo, Mali and as desk officer for Rwanda. He volunteered to work with the Commission on Security and Cooperation in Europe (CSCE) Mission in Kosovo in 1993. At the time, he told The Washington Post, “"Like a lot of people my age, I got interested in politics through the Vietnam War. I've always been interested in questions of peace and war -- and when the opportunity came to prevent a war from spreading, I jumped at it.” Prahar returned to Kosovo in 1998 to assist in establishing a U.S. observer mission. Prahar speaks Russian, Japanese, French, Albanian, German and both Mandarin and Cantonese Chinese.